Need your urgent sincere help to find out this boy’s parents. Could you please share this with as many friends as you can in any media? 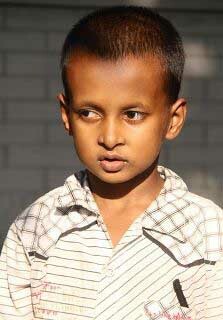 This cute boy of about 8 or 9 years was found on the way to Jhitka Bazar in Manikgonj in a sunny morning on 11 November 2011 Saturday. He can’t talk properly. Even if he can produce a word or two with his utmost effort those are not Bengali and the language can’t be understood. He is now under the mercy of a family of the village Jagaddiya, Malchi, Aroa, Shibalaya, Manikjang. While having an outing at Jhitka in Manikgonj we came across this boy and the great family who has taken the trouble to look after this boy. They requested us to help them finding out this boy’s parents. We have the phone number and address of that family. Let’s work together with our sincere efforts and affection to help this boy finding out his parents and stop their heart-rending cry of grief. This will be certainly a good work for humanity. May God bless us all. — with Aal Maruf Russell, Babul Abdul Malek, ‘Pulack Ghatack’, Ahad Pix, Hossain Mia, Abul Kashem Harun, Lead Foto, Giasuddin Shrabon, Shafiqul Alam Kiron, Ahsan Habib, Monirul Alam, Hasan Chandan, Iresh Zaker, S A Shahriar Ripon, Akjon RooSho, Rafiqur Rahman Raqu, Khan Md. Nazrul Islam, Srabon Reza and Shoeb Faruquee.